The Power Plate my3 model is the trimmest, most economical way to bring Acceleration Training exercise into any size home. A Premium Workout. At Home. The Power Plate my5 model brings great full-body fitness results in home workouts as short as 30 minutes a day, three days a week. Over 250 customized programs. Over 1,000 individual exercises. Over a million different combinations. How Does Acceleration Training Work? Before I get to how it works, let me start with its history. The technology was initially developed by the Soviets while preparing their cosmonauts for space back in the 1960s. You probably realize that one of the problems with space travel is muscle atrophy (severe muscle wasting) among the astronauts. This, along with bone loss, typically occurs when astronauts spend extended time in a zero gravity environment. The Russians found a successful way to combat this—so successful, in fact, that their cosmonauts were able to endure an average of 400 consecutive days in space, compared with only 130 days for American astronauts. The Soviets had discovered the secret of how to make gravity work for them. From there, the technology progressed and was eventually adapted for the training of Olympic athletes overseas, as well as training professional sports teams. Acceleration Training has only recently made its way to the United States, and I am excited to be sharing it with you. The research on Whole Body Vibrational Training (WBVT, aka Acceleration Training) is nothing short of incredible. WBVT achieves what no other form of exercise can, in a very short period of time. You are probably wondering like I did when I first heard of it exactly what it is. To understand what makes this technology unique, we have to start with physics. What does physics have to do with exercise, you may ask? Ok, before you scamper off, I PROMISE to make this really simple. The force (F) on an object is a function of its mass (M) and its acceleration (F). When thinking about your workout routine, you can think of force as your amount of work done. You might not realize it—or maybe never even thought about it—but every time you lift weights, you are employing this fundamental law of physics. When you lift weights, you tinker with the equation by increasing mass (the mass of your body plus any weights you use). Acceleration Training tinkers with the equation by increasing acceleration—by vibrating your tissues at frequencies of 25 to 50 Hertz, or 25 to 50 cycles per second. The mass is simply your body, and vibration is the acceleration. By increasing either (or both) of these variables, you increase the amount of force on your body, which is what puts the WORK in your workout. Gravity is another form of acceleration. Gravity is the ONE form of acceleration we are all subject to, every moment of our lives. Gravity is what causes your muscles to develop—your muscles allow you to counter the effects of gravity, so that you can move. If Earth had no gravity, you wouldn't develop muscles. That's why astronauts lose significantmuscle mass in space. Vibration is simply adding more GRAVITY to your body, or increasing "G forces." The benefits of G forces are the reason why rebounding on a mini-trampoline is so beneficial for you. Rebounding subjects your body to gravitational pulls ranging from zero G at the top of each bounce to 2 to 3 Gs at the bottom, depending on how high you jump. But the Power Plate is heads and tails better than a rebounder at generating those gravitational forces and can generate forces from 2 to 6 Gs depending on the settings used. 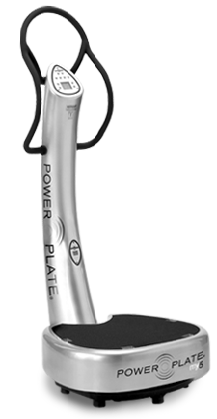 The Power Plate works by vibrating in three-dimensions, or three planes: vertical, horizontal and sagittal (up and down). If you have ever been in an earthquake, you have experienced this sort of complex motion—right and left, front and back, and up and down—it's very hard to stand up in an earthquake! But the Power Plate moves very quickly (25 to 50 times per second) across very small distances (two to four millimeters), so you aren't knocked off balance, but just enough that your muscles must accommodate. When the Power Plate vibrates up and down, your muscle tone improves. Left to right and front to back movements improves your balance and coordination. So the net result is a dramatic improvement in strength and power, flexibility, balance, tone and leanness—for starters. When you stand on the vibrating Power Plate, each muscle in your body reacts in a continuous flow of micro adjustments, expanding and contracting reflexively. Just like when your leg automatically jerks after your physician taps it with his reflex hammer, your muscles react automatically to the Power Plate's vibrations—25 to 50 times per second. Stimulating your muscles and nerves this way results in more work being done by your body in a shorter period of time—with FAR greater recruitment of your muscle fibers. If you apply 30 Hertz (30 cycles per second) for 30 seconds, you are expanding and contracting your muscles a total of 900 times in just half a minute. This means you can train to athlete status with 12-25 minutes of Acceleration Training, three days a week. Since every person begins from a different level of fitness and exercise tolerance, the Power Plate folks have made their equipment adjustable to your needs. Frequency settings range from 25 Hertz to 50 Hertz (cycles per second). Amplitude refers to how far the plate moves during each cycle, ranging from 2 mm (low) to 4 mm (high). Combinations of these frequencies and amplitudes make it possible for six strength settings, which effectively apply between 1.8 G and 6.4 G forces to your body. So, even at the lowest setting, you are almost doubling your body weight in terms of applied forces. When you are standing on the Power Plate in a squat position, simply bending your knees and contracting your muscles, you're generating as much force as someone with a 125-pound barbell on their back doing squats. By using the Power Plate, you are doing the same work as the 125-pound barbell lifter—but in a way that is safer, faster, and easier on your body. Although it is definitely not necessary, you DO have the option of adding weights. For those who are more advanced, after mastering 5 G, there are protocols for adding weights to your Power Plate routine, such as barbells or dumbbells. And with that addition, this becomes the ONLY form of fitness training to utilize forces of mass AND acceleration! 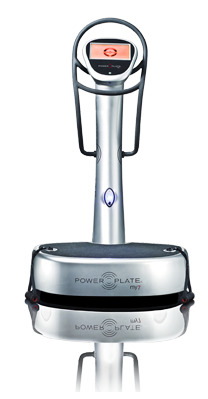 The new Power Plate my7 model is an intelligent virtual trainer that helps you personalize your workout according to the goal most important to you right now. to helpyou meet your goals. You can choose between three different lifestyle goals: FEEL better, LOOK better or PLAY better. Each is designed to help you achieve the specific results you want, all in a 30-minute or less workout that targets your entire body. The my7 features an integrated touch screen computer complete with over 250 pre-programmed workouts and 1,000 exercise videos and coaching tips to guide you to success. Whether you're preparing for a marathon, warming up for the ski season, looking to lose weight or want to specifically support your bone health, my7 has a unique program to help you get there. The my7 is the first full-body home machine to feature proMOTION Dynamic Vibration Technology, a dynamic technology that stimulates muscle response as frequently as 30 to 40 times per second. Using high strength Vectran cables that optimize the transfer of vibrations generated by the platform directly to the targeted muscle, the my7 offers added benefits from this Advanced Vibration Technology™.